January 22nd AUSTIN HI, HOW ARE YOU DAY - News - The Official Daniel Johnston Web Site - Hi, How Are You? 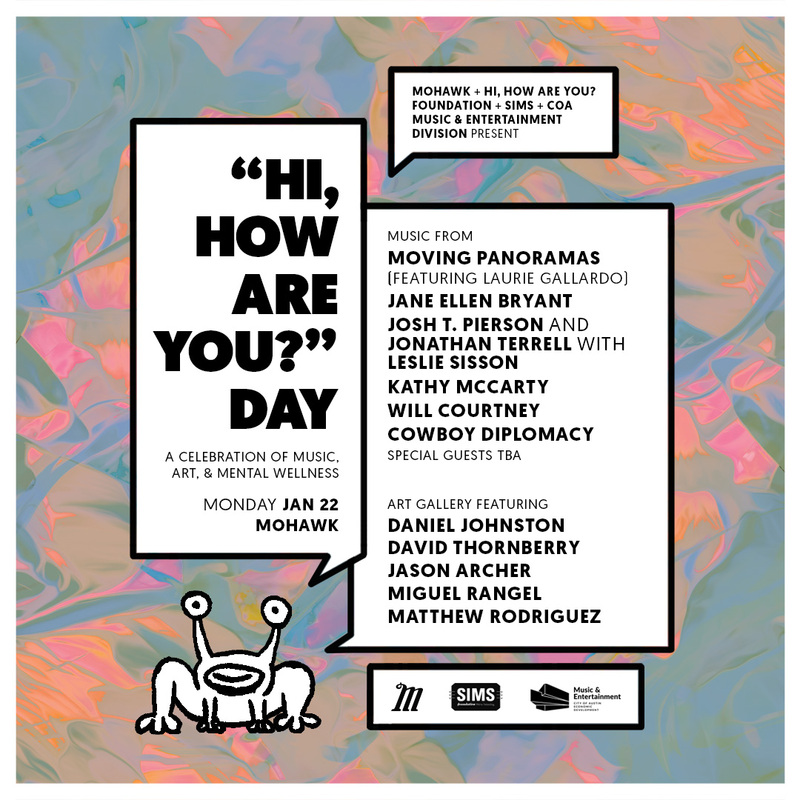 JANUARY 22 TO BE DESIGNATED “HI, HOW ARE YOU?” DAY IN AUSTIN Awareness for city-wide, neighbor-to-neighbor mental well-being check-in highlighted by a night of music and art and featuring performances by, Moving Panoramas, Kathy McCarty, Cowboy Diplomacy, Jane Ellen Bryant and Will Courtney. (AUSTIN, TEXAS – January 9, 2018) – “Hi, How Are You?” Foundation is pleased to present, in partnership with SIMS Foundation, City of Austin Music & Entertainment Division, and Mohawk, a night of music and art celebrating mental wellness on Monday, January 22 at Mohawk, located at 912 Red River St., Austin, Texas, 78701. The line-up includes Moving Panoramas (featuring Laurie Gallardo), Kathy McCarty, Cowboy Diplomacy, Jane Ellen Bryant, Will Courtney, Leslie Sisson with Josh T. Pierson and Jonathan Terrell, and special guests. The musicians will perform select songs written by Daniel Johnston, as well as their own original music. The event starts at 6:30 p.m. with a VIP art sale and cocktail hour with bites by Frank, and features works by artists Daniel Johnston, David Thornberry, Jason Archer, Miguel Rangel, and Matthew Rodriguez. Art will be for sale throughout the event and music starts at 8:00 p.m.
“Hi, How Are You?” Day is the brainchild of Courtney Blanton and Tom Gimbel, co-founders of the aptly named “Hi, How Are You?” Foundation that promotes togetherness and education around mental well-being. It derives its name from the beloved Austin frog, “Jeremiah the Innocent”, famously painted on the corner of Guadalupe and 21st Street by singer-songwriter and visual artist Daniel Johnston. Johnston’s own mental health issues have long been chronicled and serve as inspiration to the music community and beyond that mental wellness can be a challenge for all of us and we need to check our mental health just like we get a physical at the doctor. “Hi, How Are You?” Day, will be officially proclaimed by the City of Austin on January 22 and will remind citizens of Austin to check on their friends and neighbors’ mental health and offer assistance and resources if needed. "SIMS Foundation is thrilled to be part of this creative effort to reduce stigma for seeking mental health services,” said Heather Alden, Executive Director of SIMS Foundation. "Musicians make eloquent and poetic work out of their emotions. But, emotional well-being can be difficult to maintain. We want the Austin music family and all Austinites to know resources exist for treating their mental health issues. " MEDIA NOTE: To RSVP for the Jan. 22 event, or general press inquiries, please contact Courtney Blanton, cb@courtneyblanton.com, 917-853-0568. I would love to be there!! !